Here's the thing about great ideas: sometimes the most brilliant ones are those that seem, in proposal form, to be the most ludicrous, counterintuitive, and totally harebrained. Take one of the world's greatest works of literature, James Joyce's Ulysses, a weighty work of intricate depth that displays language at its most brilliantly musical -- a work not normally described as very visual, much less narrative, what with its intertwined and overlapping plot elements. Attempts to make film adaptations of this work have been inadequate -- ending up as snippets of narrative illustration that generally strip the life out of a rich and lyrical work. Thus, visualizing Ulysses in any alternate medium is not met by fans and academics with grand enthusiasm, and any idea to do such would definitely fall into the realm of the lunatic, and possibly even heretical. So, along comes artist Robert Berry, with, of all things, a serialized electronic comic book -- yes comic book -- adaptation of Ulysses, called Ulysses Seen. Lunacy and heresy, right? As it turns out, Ulysses Seen, created for viewing on iPad and the web, is a perfect example of that truly crazy idea -- spawned, no less, in the time-honored tradition of a bet over beers -- turning out to be utterly brilliant. With just a glance at the first panels, which are beautifully, if simply, rendered and moodily colored, it's obvious that Berry has a genuine love for and understanding of this book, and that his adaptation is not mere illustration, nor educational guide (though it can function as such, with its extensive reader's guide and interactive features), but a masterful expansion of a masterwork. Ulysses Seen is ultimately a work of art in itself that resides in a sort of parallel and enriching dimension to the original book. It neither takes the place of nor cheapens the experience of reading the original, which is no small feat. Michael Barsanti, a Joyce scholar who for years worked at the Rosenbach Museum and Library in Philadelphia -- home of the original Ulysses manuscript and a thus a locus for Joyce studies -- and who is now the official "Joycehead in Residence" for the project and contributor to the accompanying reader's guide (a task he now shares with Janine Utell), was one of those who initially thought Ulysses Seen was "a ridiculous, incongruous idea, partly because of the scale [of the book], and partly because not much seems visualizable." But upon looking at Berry's drawings, he completely got it: "I found it was adding something to the novel for me, and brought out deeper elements I hadn't thought about before." Barsanti was particularly impressed by the way he suddenly saw the positions of characters in space, enhancing "Joyce's profound interest in drama... [the graphic novel format] gives you a way to show things in space and time that are different than something like film," he explains. Ulysses Seen is the inaugural project of Throwaway Horse, LLC, which aims to "ensure the continued vitality and relevance" of public domain works of great literature by joining visual interpretations with the "explicatory aid" of the internet. Berry's partners include Josh Levitas, who helps bring Berry's traditional watercolor and ink renderings into digital life (the admittedly non-computer-literate Berry describes him as "the wind beneath my wings"), and Chad Rutkowski, a copyright attorney who manages business issues. The shared impetus is described thus: "The Throwaway Horse members love this book [Ulysses], and it kills us that it has gotten the reputation for being inaccessible to everyone besides the English professors who make their careers teaching the book to future English professors who will make their careers doing the same. 'Tweren't supposed to be that way." Creating and releasing Ulysses Seen in serial fashion via electronic media makes it more of a living, breathing entity, something Berry sees as critical to its success. He loves that in addition to academics, there is now a new body of fans -- regular readers -- "getting into the Ulysses interpretation game." On the website and through the app, Berry gets active input from readers and scholars on an ongoing basis, "often telling me what I'm doing wrong" he relates. But he takes all of it into consideration, and these comments are used to inform the way he shapes and interprets future chapters. Berry also feels that this considered, serialized approach will ensure that, unlike Joyce with the original Ulysses, "I will not go back to make multiple revisions to various editions." So far, two episodes of Ulysses Seen have been released: "Telemachus," the first chapter of the book, which introduces us to the character of Stephen Dedalus; and then, in an initially counter-intuitive but ultimately inspired move, the fourth book chapter, "Calypso," which introduces us to Leopold Bloom (and takes place concurrently with the events in the first chapter). The logic in this jump was to introduce the two main characters from the get-go, and releasing the episodes chronologically in a hope to engage readers -- especially those new to the book -- more fully. Berry explains that most people he's encountered who have given up on reading Ulysses stop reading "around the first three chapters, which are difficult." He continues, "I wanted to get to Bloom right away... making it easier to shape the direction of the day" for readers. Berry is obviously not one to shirk a challenge. By his own admission, he can't imagine working on a more complex, completely frustrating author to interpret in a comic adaptation -- and this is why he describes the project as "incredibly rewarding," albeit something that ultimately will take years to complete. And that, in itself, makes Ulysses Seen -- well, Joycean. Full disclosure: I personally am one of those creatures dubbed "Joyce trekkies." What does this mean? In short, it refers to those fans who are involved with the work of James Joyce, especially Ulysses, to an obsessive degree, willing to read this book over and over ad infinitum, and feeling highly protective of its legacy. Oh, and we actually celebrate June 16 -- Bloomsday, the anniversary of the day in 1904 when the events of the book, featuring the protagonists Stephen Daedalus and Leopold Bloom, take place. Celebrate it like it's Christmas, or 1999, in fact. Ulysses Seen artist Robert Berry is not only an obsessive Joyce fan of course, but as a comic artist, carries a deep reverence for masters such as R. Crumb. 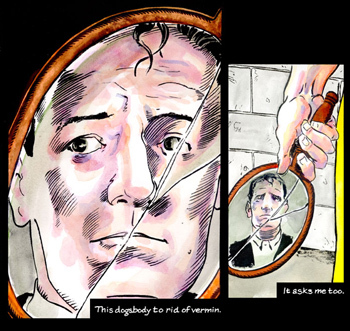 So is seemed only natural that for Bloomsday this year, Berry would meld the two into a commemorative graphic, appearing here, with the artist's permission, as a Huffington Post first-run exclusive. 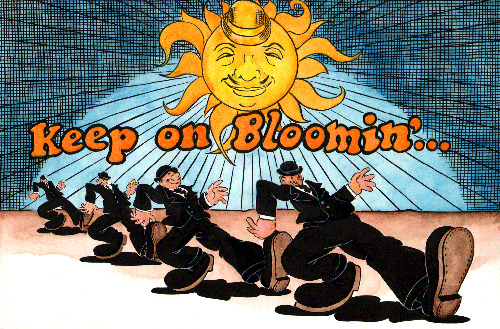 Happy Bloomsday to all!